Images above: Diahann Carroll, Paul Robeson , Billie Holiday, and Pearl Bailey photographed by Carl Van Vechten. Photographs by Carl Van Vechten are used with permission of the Van Vechten Trust; the permission of the Trust is required to reprint or use Van Vechten photographs in any way. To contact the Trust email: Van Vechten Trust. Poet, critic, and translator G. E. Patterson is the author of To and From and Tug, winner of the Minnesota Book Award. Patterson’s awards include fellowships from the Bread Loaf Writers Conference, Cave Canem, the Djerassi Foundation, the MacDowell Colony, and the Minnesota State Arts Board. After living in the Northeast and on the West Coast, he now makes his home in Minnesota, where he teaches. 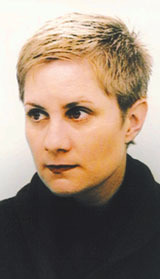 Jennifer Moxley is the author of books of poetry including: The Line, Often Capital, The Sense Record ; and Imagination Verses. Her memoir The Middle Room was published in 2007. She has translated two books by the French poet Jacqueline Risset, The Translation Begins and The Powers of Sleep. She is poetry editor of The Baffler, and contributing editor of The Poker. She works as an Associate Professor at the University of Maine. In honor of National Poetry Month, throughout April the Beinecke Library’s Room 26 Cabinet of Curiosities will feature poetry-related collection materials from the Yale Collection of American Literature and the James Weldon Johnson Memorial Collection of African American Arts and Letters. Stop by often–new posts will be added twice a week. Image: manuscript draft of H.D.’s “Hippolitus Temporizes” (YCAL MSS 24).